A movie with an interesting enough premise that just doesn’t dive into the mystery that is trying to be solved, as often or as much as it should. 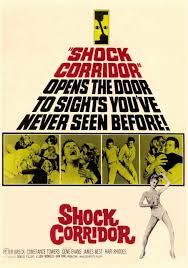 Shock Corridor is a combination of two different storylines and two different types of movies. on the one hand, it’s a muder mystery. That’s the reason why johnny, the protagonist, fakes being insane and gets himself committed to a mental institution where the murder has taken place. Then on the other hand, this is a story of a man who is wrongfully imprisoned and goes in normal, but slowly deteriorates to become more like the patients all around him. If both stories were given attention and detail, than this would have been a great film. But the murder storyline is just there for show, to give johnny a reason to get inside. That’s why we never learn many details about the murder. instead, the movies attention is devoted to the storyline about his mental state, and interesting as it is, it would have been nice to have more attention paid to the murder story as well. Shock Corridor is one of those undercover reporter movies where the main character is a fish out of water, trying to penetrate a world he does not know at all, in order to get information. It seems like it’s been done a bunch of times before, but shock corridor finds ways to make the premise feel fresh. That’s because it’s more than just a simple lie which gets Johnny Barrett committed, and it’s more than just him involved in the lie. Johnny is out to win a Pulitzer Prize by solving a murder case. At a mental institution, one of the inmates has been murdered and nobody knows who did it or how it happened. The police have tried to get answers, but from the outside, nobody is really telling them the truth. That’s when Johnny starts thinking that if he can get on the inside, and have the inmates think he is one of them, then they might start opening up about what happened. Johnny gets help from his higher ups at the paper to pull this off. They hire a psychiatrist to help johnny prepare and learn how to act like he is crazy. This psychiatrist also helps johnny come up with a story about how he has a sexual fixation on his sister, going all the way back to when they were kids and he used to tug on his sister’s braids. The only problem is that johnny doesn’t have a sister. he needs to get his girlfriend to go along with the whole thing and pretend to be his sister instead. a movie like this would never work today, because there are just too many holes and simplicities involved. the hospital would be able to check, for example, if johnny actually had a sister or not. back when the movie was made, in 1967, there was no internet, and information wasn’t as easily accessible as it is today. johnny would probably be recognized by someone at the hospital as a reporter, and either he or his girlfriend, would probably blow the act and get caught. still, for the simpler time that this movie was made, the premise works. Johnny has to meet with a psychiatrist before he can be committed, and so the sister goes to report him and gets someone to meet with him about his issues. this is johnny’s chance. he says all the right things and hits all the right buttons to get himself institutionalized. he even attacks the psychiatrist when the man hits on johnny’s feelings about his siter. the next thing we know, johnny is locked away as one of the inmmates, trying to follow clues and find out who committed the murder. here is where the problem with the movie begins. we never find out enough details about the murder. at the very least, we, the audience, should be privy to the police report and know some of the details about what happened here. we should know what the police know and what Johnny is going in knowing. it would have been smart if the movie gave us a list of suspects for johnny to watch closely while he was inside, by showing us their photos before he met them. but this movie isn’t really interested in the murder. it pretends to be, but really is just using that whole thing as an excuse to get Johnny inside and to get at the bigger story. that story is about how Johnny can be a regular guy locked away, and can end up going crazy himself just from being around these mental patients, getting all of the electroshock therapy, and basically becoming one of them. shock corridor ends up being like a combination of three movies. Twelve Monkeys, Shutter Island, and Midnight Express. Like Twelve Monkeys, he is sent into the institution in order to retrieve information. like shutter island, he is sent in to investigate a murder. 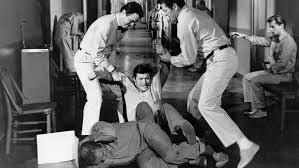 that movie, of course, gave us many more details about the murder, or disappearance of the patient, and let us sit in on interviews conducted between the us marshals office and some of the characters. shock corridor misses this step and it’s a major one. as the movie goes on, the focus changes from being about the murder to being about johnny’s own condition. at this point, the film becomes more like midnight express, and the scene where billy’s girlfriend comes to visit him in prison and can barely recognize him because of how insane he has become. that’s the direction that shock corridor is headed, and it plays almost like a short story with a very simple message of not getting in over your head, because you never know what can happen. if you play with fire, you just might get burned. something like that. i like the movie for what it does, but also have problems with what it does not do. the combination of a murder mystery with a situation of a man in an asylum who goes more insane just from being there, is an interesting one. if both stories were handled right and given the time and detail they deserve, then this would have been a great film. unfortunately, the movie doesn’t try to do justice to both storylines, and really focusses it’s attention on the johnn’ys mental state premise. that area of the movie is great. it would have been nice if the murder plotline was handled with the same level of attention.